For my card with Penny Black La Fleur Rouge, I've used a similar stamping technique as Elizabeth. I first inked my stamp with Tombow markers, misted with water and then stamped onto watercolor paper. For additional blending, I then colored directly onto the paper with the markers and blended the color with a wet paintbrush. I also added a touch of blue to the background. It's hard to believe Christmas is just a week away! 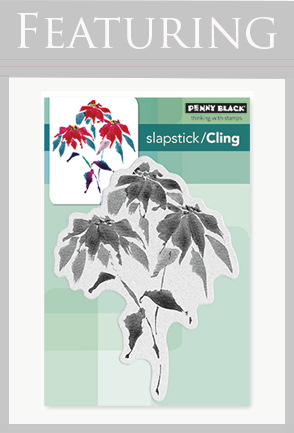 We'll be back with one more "Penny Black Pairing" before Santa comes to town!